Far I Films has announced May 13th as the opening date for the gritty Jamaican action/drama motion picture ‘Out the Gate’ in New York City. Showing in National Amusement Multiplex Cinemas and AMC Theatres, the highly anticipated feature has the distinction of being the first Caribbean movie to have a multi-theatre opening since the 90’s. The film stars two of Jamaica’s most celebrated actors, Paul Campbell (Shottas, Dancehall Queen) Oliver Samuels (Oliver at Large), as well as Shelli Boone (Holla, Southland) and Everton (E-Dee) Dennis, The story follows a dreamer (Dennis), who after a turn of unfortunate events, leaves his home in Jamaica to follow his dream of making it big in the music business in Los Angeles. Life is not a bed of roses in America, but with struggles and perseverance he finds love and success only to have it all threatened when the Don of LA (Campbell) demands his dues. the movie”, he concluded. Also playing roles in the film are Dancehall Reggae artists Mr. Lexx, Lady G, Ms Triniti, and Edley Shine. Rounding out the cast is american actress Brenda Vivian who has had recurring roles on “Young and the Restless” as well as “Days of our Lives”. 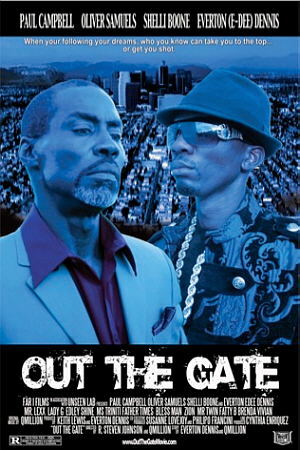 ‘Out the Gate’ is the directorial debut for the team ‘The Village Brothers’, R. Steven Johnson and Qmillion. The four theaters chosen for the engagement are the AMC Bay Plaza Cinema 13, the Whitestone Multiplex Cinemas, Linden Blvd Multiplex Cinemas, and the Jamaica Multiplex Cinemas located in the heavily Caribbean populated boroughs of Bronx, Brooklyn and Queens. The soundtrack, to be released on Unseen Lab Recordings, boasts some of Dancehall and Hip-Hop’s biggest names like Beenie Man, Jadakiss, Busy Signal, Styles P, Turbulence, and many more. Plans are underway for the film to continue on to Jamaica, as well as Miami, Toronto, and London. Comments for Jamaican Film ‘Out the Gate’ Set for New York Opening in AMC and Multiplex Cinemas are now closed.